CNC lathes use standard turning tools to generate profiles on the outside of a part and boring tools to finish the inside of a part. The machine is programmed to move the cutting tools as needed to generate the desired part shape. These programs are generated either on the machine control or on an off line CAD/CAM system. This combination allows the machine operator to create virtually any shape simply by changing the machine program or a few tools. Since CNC lathes use general purpose tools, set-up time is faster and startup tooling costs are minimal. In addition CNC lathes have the potential to run larger diameter and longer parts than a screw machine. And most importantly CNC lathes are more accurate and maintain better surface finishes. 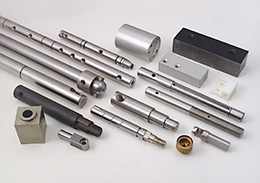 CNC lathes are capable of axis repeatability of within .00015 and are capable of holding part tolerances of .0005. So why do we need screw machines? Screw machines are faster. Since CNC lathes use single point tools to “whittle” out the part shape it can sometimes be time consuming. Whereas screw machine can have multiple tools in the cut at the same time. However the increased production must be balanced against the increased set up and tooling costs. If your part is too large for a screw machine, or if the tolerance are too close, or the lot size is too small then a CNC lathe is the best option. But if it is feasible to run your part on a screw machine, in most cases it will cost less. We do this evaluation on every parts we quote to ensure that we are providing our customer with the best part at the best price. Our CNC Turning department consists of a variety of two and four axis turning centers complete with hydrostatic bar feeds and sub spindles. We use a DNC program storage system to maintain our part programs. This guarantees consistent part geometry and faster set ups in subsequent production runs. In addition we have several CNC lathes with "gang" style turrets. These machines excel at running small diameter chucker type work with fast cycle times. To learn more about our CNC turning services, please review the table below, or contact us directly.